It’s time for another item from the DC Omnivore 100 list of the top one hundred foods every good omnivore should try at least once in their lives. Cream tea, high tea, afternoon tea… what’s it all about? 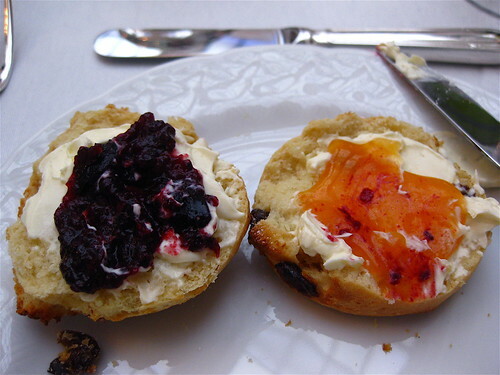 And why does the Omnivore 100 list have “cream tea” instead of one of the other terms? I just remembered seeing little signs for “cream tea” while wandering around cute villages in the Cotswolds, but have never seen it used around here. Then there’s the constant “high tea vs. afternoon tea” debates that erupt on food forums, everytime someone asks where to get “a proper high tea” in this town. As luck would have it, last night at the Women’s Chef & Restaurateurs Awards gala, I had the pleasure of meeting an actual tea sommelier! Cynthia Gold explained the difference between these three terms, with some history to boot. Like so much food lore, the actual reasons were not at all what I expected. It all comes down to table heights. First off, “high tea.” Most Americans make the mistake of thinking that “high” in this instance means lofty, regal, impressive. 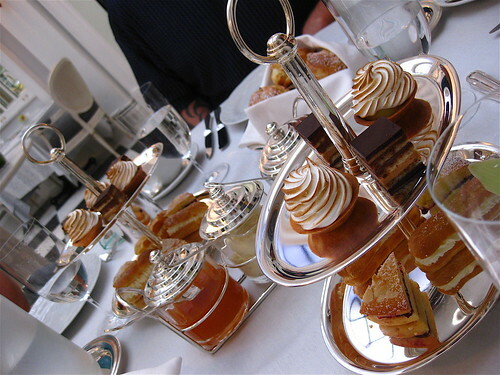 But actually, “high tea” was also known as “meat tea” – which gives you a better idea of what was involved. This was a hearty farmers’ meal, served after work, perhaps with meat pies or pasties, definitely more substantial than delicate finger sandwiches. So why “high?” Because it was served at regular table height. Whereas “afternoon tea” was orginally known as “low tea,” as it was handed down to you by a butler at parlour table height. Eventually the word “low” fell out of use, and “afternoon” came into vogue – but “high” remained. Hence the confusion. “Afternoon” or “low” tea service originated with Anna, Duchess of Bedford, a lady-in-waiting to Queen Victoria who needed something to tide her over between lunches and late formal dinners. This is the tea most people think of – delicate savory sandwiches, scones with cream and jam, pretty pastries – a luscious snack so one does not pass out in one’s corset before dinner. And finally, “cream” tea is simply afternoon tea without any savories. No cucumber sandwiches, just scones with clotted cream and jam, perhaps a sweet or two. Got it? Good, because now I’m starving. My favorite afternoon tea in DC is at The Jefferson, where the scones come out fresh from the oven and have the most divine scent. Small and perfect, you can easily eat two. Clotted cream and three kinds of jam round out that heavenly experience. The tea blends they serve range from the classic Earl Grey to more exotic like Lemongrass. And the atmosphere of the coolly elegant Greenhouse would’ve please Queen Victoria herself. 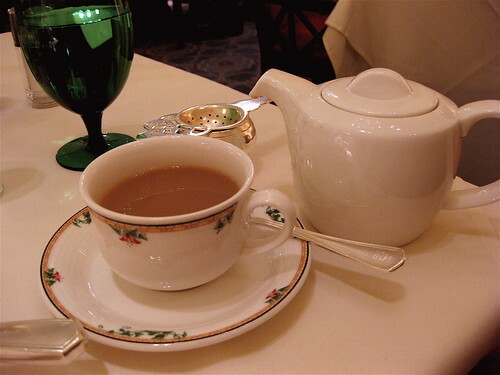 Let us know your favorite spot for tea! your pictures make me hungry!! !